On Saturday afternoon, we stopped at a garage sale near the old hospital in our neighborhood in Elmhurst. Nat was after some baby stuff, I think. All the way in the back of the garage was this thing: a 1968 Rowe/AMI Jukebox that is chocked full of disco 45s. After a little bit of haggling, I was rolling this thing down her driveway, across the 10 blocks it took to get to our house, down our alley and into our garage. Yep. We're now the proud owners of a (mostly working) late-60's jukebox! We already had - with the Babe - our first dance party in the garage on Saturday night. The amazing thing is that it works and it works well. The action on both the flywheel and the record arm are amazingly smooth for having sat in this garage for the better part of 30 years. Sure, there are a few quirks, but I'd expect that for something that is more than 40 years old. I've already scouted out a bunch of classic 45's that I can pick up on Craigslist and eBay to change the tunes out to more my taste. It weighs 400 lbs and is pretty delicate (due to the tubes and the wiring and what not), so I have to figure out a plan to get it down to my basement. Then, and only then, will we be able to really call it a "rumpus room". 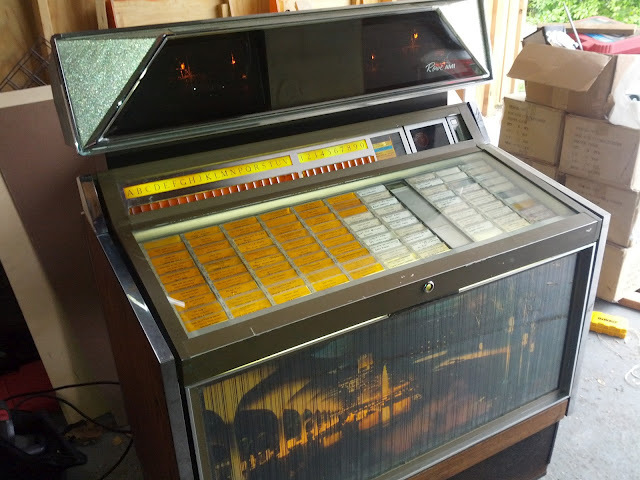 I have a jukebox exactly like this particular one. Have you had yours appraised or have any idea how much it may be worth.